Jacinta´s project aims to reflect over what happened with the American Dream and what it derived from. When moving from Australia to USA life wasn’t as she expected. Then she read about Sweden. The more facts she came across the more frequently Sweden where mentioned as a benchmark for how a society could be structured. Her work is in the form of physical theatre, a mix of storytelling, dance and an actual break down of facts and stats. Read more about the project at Jacinta´s own site Thisamericandreamproject. Ethan has during his four weeks here collected sounds through his project Found Sounds. From these samples he composes music that is in between noice/soundscapes and beat driven compositions likewise driven by POP DNA as much as soul searching. 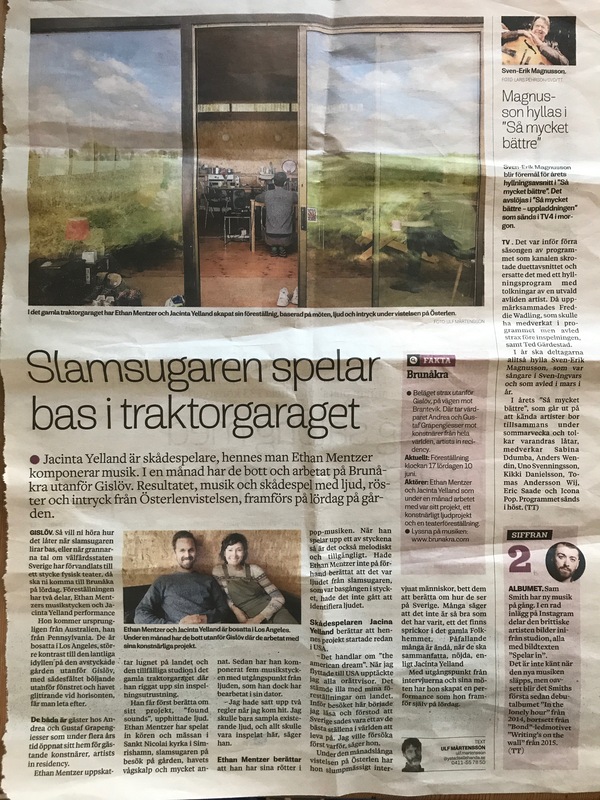 Ystad Allehanda wrote a very nice piece about their stay. Posted on 2017/06/12 2017/06/12 by admin	This entry was posted in RESIDENCY. Bookmark the permalink.